Earlier this month, I participated in The Kitchen Cure. I tracked my progress here, and in this flickr set of before and after photos. As you can guess, I’m still catching up. Today on my lunch break, I took a few minutes to finally get the serving dishes into their new home, where I can more easily access them. Some of them are blocked from view by other things in the cabinet that i use more frequently, but you can see some pieces at the top left here. I also took a few pictures of a couple of other small things that got rearranged or changed since their original after photos, you can see them if you click through. I didn’t take a picture but I also tried to clear a little extra space in the pantry/coat closet, where my home canned goods go. I have probably two dozen jars of various sizes that need to be added to the already large collection. Anyway, moving the serving dishes freed up the milk crate they’d been in for me to corral some things in the utility closet. I am still struggling to keep that space organized, and the more I think about it the more I think it might be worth it to buy some shelving to install in there. It is very much prone to becoming my dumping ground for things that I don’t know what to do with immediately. So, it looks super cluttered when I walk by (the door stays open as the litter box is in there), which bugs me. A good percentage of the stuff in there is stored in plastic tubs, and so anytime I need to get in one of those, I have to remove the clutter from the tubs, and then shift the tubs around as they are stacked on one another. 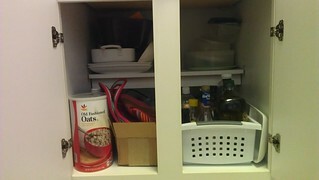 I did organize things pretty well, so stuff I use frequently is in tubs on the top. But it’s still a pain, and there’s not much room to move in there. Being able to just slide out the one I want would be ideal.